Parent’s Connect is a free online class series designed to support Ashland & Bayfield County parents in this challenging, rewarding role. Parents of kids age 3-12. Strength-based learning, discussion, videos and more . Twice monthly, 2nd & 4th Tuesdays, 1:00 & 6:00 pm, 1-hour sessions plus time for Q & A. Join live video conference from phone, laptop or computer. 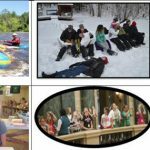 This newsletter is a collaborative effort between the Bayfield County offices of the Aging and Disability Resource Center (ADRC) of the North and the UW-Extension. Both departments are committed to providing a broad array of information and resources to older adults, caregivers and family members to assist them in growing and aging with grace, dignity and respect. 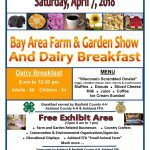 April 7, 2018 Bay Area Farm & Garden Show AND Dairy Breakfast served by Bayfield County 4-H, Ashland County 4-H and Ashland FFA. You are invited to a showing of RESILIENCE, a one-hour documentary that delves into the science of Adverse Childhood Experiences (ACEs) and the birth of a new movement to treat and prevent Toxic Stress. Now understood to be one of the leading causes of everything from heart disease and cancer to substance abuse and depression, extremely stressful experiences in childhood can alter brain development and have lifelong effects on health and behavior. Two showings-1/25 in Iron River; 2/21 in Washburn. A Master Gardener is a trained volunteer who aids University of Wisconsin Extension Staff by helping people in the community better understand horticulture and their environment. UW-Extension in partnership with CheqBay Renewables and the City of Ashland will be hosting a Renewable Energy Winter Workshop Series with sessions happening each month this winter. 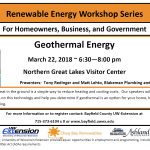 The purpose of the workshops is to provide information to homeowners, businesses, and governments on renewable energy options including biomass, solar, and geothermal. Fall is the time to plant your garlic! Get that garlic in before the ground freezes! 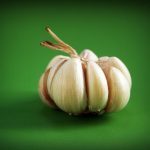 Can I plant the garlic cloves that I get from the grocery store? 4-H Older Member Awards . . . .